Nancy Meyers has good taste. The notoriously enviable interiors in her movies– the lavish getaway home of Something’s Gotta Give, the pristine bakery and matching house kitchen in It’s Complicated– aren’t just illustrations of her heroines’ lavish lifestyles, they’re basically characters themselves. Her latest, The Intern, is another proud continuation of that stylistic tradition, but taste-making is also one of the movie’s subjects. Set mostly within a thriving, millennial-infested clothing start-up in Brooklyn, The Intern provides ample space for Meyers’ production team to create an enviably modern workplace. The movie never views that work-space as an alien world, everyone fits right in. This is true even as the script takes the point of view of 70-year-old Ben (Robert DeNiro), who is selected for the company’s senior internship program. He’s assigned directly to shadow the CEO Jules Ostin (Anne Hathaway), who started the business and is struggling to hold onto it as it continues to grow and expand. The investors are pressuring her to pick a new CEO, someone with more experience with bigger companies. All of the choices are men. It just wasn’t what I was feeling. And I felt I’d covered that subject pretty well: to fall in love, and out of love, and be divorced, be Cameron Diaz’s age, or be Meryl Streep’s age. So I thought, A relationship between a man and a woman that’s not romantic, this is interesting. I’ve never done that. 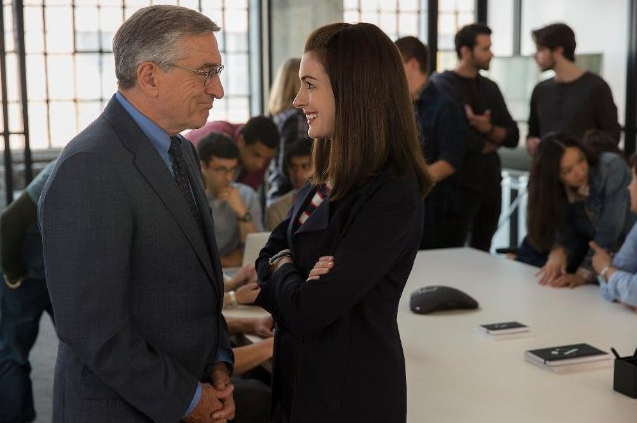 The Intern is a grand feminist statement, and a very funny one, at that. It does not give one of the misogynistic CEO candidates any screen time for a “well, actually…” moment. Everyone on screen is pretty much in agreement that Jules should remain in control of her business, even her adorable, adulterous husband (Anders Holm). The generational conflict that is inherent in the premise is not played for cheap sexist jabs; Ben does not opine for the good ole days, and is in fact probably Jules’ biggest advocate. Meyers uses Ben’s presence in the office as a way to explore the shifting ideals of modern masculinity, or as she put it in the aforementioned Vulture interview, “the difference between this man and the millennials.” Ben shows up to work every day in a full suit and tie. He coaches another employee on how to win over the receptionist he wronged. He listens and observes, and he knows when he has something of value to contribute. He doesn’t just assume that his perspective is the one that’s right for every situation. In a key scene, Jules takes several shots at a bar and wonders out loud to a group of young male employees how men went from Ben (whom she favorably compares to Jack Nicholson and Harrison Ford) to… them. (Straight) men have gone from men to boys and (straight) women have gone from girls to women, Jules (and Meyers) argue. Is Meyers taking aim at Judd Apatow? Maybe a bit, but The Intern doesn’t necessarily hate its millennial men. Part of what makes the movie so refreshing is that in finds humor in compromise rather than conflict, showing how Ben is a positive influence on Jules’ company and vice versa. In fact, The Intern runs into the most trouble when it starts forcing a more intense conflict in the third act. In the final 15 minutes, when Jules suddenly forgives the cheating husband not even a half a day after finding out about his infidelity, it becomes a rushed, emotionally incoherent mess. Meyers ends the movie at least three times before the credits actually roll. That’s unfortunate, because if she had stuck the landing her most ambitious movie may have turned out to be her best.